Our Appalachian adventure begins at Waterrock Knob Overlook, the starting place for a scenic mountain hike to the top of Waterrock Knob. This peak (6,292 feet) is the 16th highest mountain in the Eastern United States. On a clear day you and your four-footed hiking buddy can have 50 mile views from the summit. And if you don’t feel like hiking, there are fantastic views both east and west from the “mile high” parking area complete with picnic tables, to soak in the views. If waterfalls are your passion, grab your hiking boots and make your way to the pristine, iconic Smoky Mountains waterfalls of Haywood County. With hikes ranging from a few feet to several miles, Waynesville and Maggie Valley have 18 different hiking trails with waterfalls that range from beginner to advanced. One of the most popular is Soco Falls, a short descent off US 19 in Maggie Valley. An observation area is perfect for selfies of you, the falls and your furry companion. If you and your dog love canoeing and kayaking, water adventures at Lake Junaluska will float your boat. The lake area includes a paved walking trail around the lake, a magnificent Rose Walk, both pet friendly, and boating on the Lake. While boat rentals don’t permit dogs, you’re welcome to bring your own canoe, kayak or paddleboard and experience the Lake with our pup. 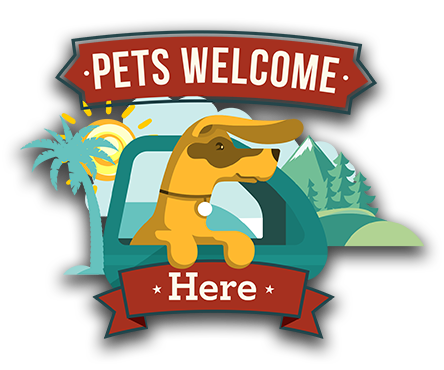 Of course, a trip to the Great Smokies must include a visit to one of the most pet friendly towns in Haywood County. Take a step back in time and discover Waynesville, “Gateway to the Great Smokies.” The charming Historic District welcomes pets with water bowls outside many of the shops and invite dogs and parents to browse inside as well. Bring your dog for a special treat to the Smoky Mountain Dog Bakery on Main Street, dine at outside tables at local eateries and shop for Appalachian treasures. No visit to Waynesville would be complete without a stop at Frog Level Brewing with locally brewed craft beer that’s as amazing as their dog friendly, creekside back patio. A local favorite, Frog Level offers canine guests the finest vintage fresh water. When it comes to a special dining experience, Frankie’s Italian Trattoria in Maggie Valley has delicious Italian fare and a covered pet friendly patio. Frankie’s focuses on delicious food and family, including the fur kids. In addition to dining, Haywood County has many pet friendly accommodations, and just a short distance from Frankie’s is one that is a doggie delight. The Meadowlark Motel welcomes furry guests with treats and water-and-food-bowls at check-in. The cottages, cabins and guestrooms are located along a scenic creek and have ample grounds that are pet friendly. When you check in, you just might find the motel’s two dogs waiting to greet you.